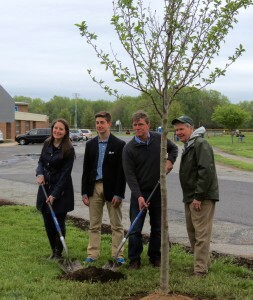 This year’s Arbor Day Celebration was held at William Allen Middle School sponsored by the Moorestown Garden Club and the Tree Planting and Preservation Committee. Two Newport Flowering Plum and three Yoshino Cherry trees were planted in a grass strip along the exit. Student Jack Comegno and the student council were responsible for raising funds for the trees. Donations were made by Comegno Law Group, Flagg’s Nursery and Garrison Architects. Taitco/Tait Roofing hung the Main Street banner. A ceremony was held at 10 a.m. on Arbor Day with a welcome from Lisa Madara, Moorestown Garden Club president, and the history of Arbor Day by David Schill, Moorestown Improvement Association president. Mayor Phil Garwood presented a proclamation proclaiming April 29, 2016 Arbor Day in Moorestown. The Middle School Honors Chorus entertained the crowd with three songs. An award was presented by the Appearance Committee to the Moorestown Field House for the beautification of their property. The Middle School Garden Club presented birdhouses and pinecone feeders they had made to be hung in the trees. A ceremonial tree was planted after the ceremony. Two hundred bare root seedlings were given away to the public to encourage them to plant trees in their own yards to create memories and improve the environment. The Moorestown Tree Planting and Preservation Committee would like to thank the many sponsors and volunteers who made today’s celebration possible.